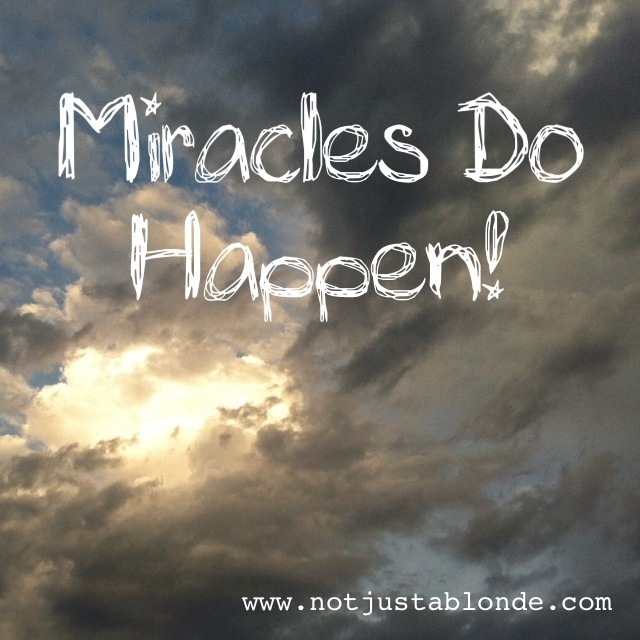 My miracle moment was both the most extraordinary and ordinary moment of my entire life. The day of the miracle started out as a typical day. On that day I felt just as normal as ever. I wasn’t vigorously seeking God nor actively turning from Him. Honestly, until that miracle moment I hadn’t thought much about Him that day at all. It happened several Summers ago, during a family reunion that was being held not too far away from my home. I headed down to the gathering place with my two eldest sons. Much of my family was there including my twin sister, my mom, my grandmother, and many of my aunts, uncles and cousins. We were sharing in the normal commotion, good conversation and good food that the typical reunion offers. It was during this reunion I was able to talk face to face with a dear Aunt of mine. She and my Uncle had been going through a very spiritually anxious time with the stress of future work and finances at an all time high! I was listening to her as she shared the complicated details of the painful situation. I actively listened to her heartache as her fears bubbled over and she questioned what was to happen next and how God would provide. That’s when it happened. The Miracle. The Voice of God. But it actually wasn’t really a voice at all… more of a Knowing with a message for me to share from God through the Holy Spirit of Christ to her. Directly. As I was being instantaneously told what to tell her…the words came out as I surrendered to the message… she looked at me and she nodded, receiving the message without bewilderment or question! It was absolutely clear that the message was from God. When God Speaks… there is no doubt who He is! I couldn’t believe what had just happened! Yet my Aunt with her strong Faith didn’t seem surprised at all that God had a message for her and she received it openly and seemed to get some encouragement and Peace from His Word. Before I relayed God’s message I automatically stated “God wants me to tell you something” and before I had a chance to absorb what was happening the message poured out out like a fountain of hope! The message was something like “Everything is unfolding as it should for your better good”… the phrasing was strange and not in any way phrased how I myself would talk! As the conversation concluded I was in somewhat of a heightened daze…like I had been hit (because I had!) by spiritual lightening! I walked away in shock and in total awe of what had occurred! I wanted to yell out “Everybody! Stop! GOD HAS SPOKEN!” It still seemed so unbelievable even though I had no doubt of it’s Truth! What the heck just happened?! God? Spoke through me?! So unbelievable yet so Real. I immediately searched the room for my (twin) sister to share with her what had just occurred! Would she, could she believe me?! Now, I’m telling ya up until this day I had not been especially religious (I hadn’t gone to church in months!) nor spiritually driven. I mean, I believed in God and considered myself a Christian, but was more coasting on Faith than actively pursuing God. Because I suppose I have always been honest with her, or perhaps she reacted in Faith, she seemed to believe me…and for that I was so very grateful! I had someone to process this with and to share in that moment. The moment that was in no special place, with no special messenger… completely ordinary in both respects… immediately changed my path and my life for good. I’m telling you… when God speaks… you listen… and afterwards you want to share it! It was miraculous! And with that I began a new more committed Spiritual path that led me to where I am today. Since that time I have heard His Voice speak through me to others… those stories are beautiful and profound… each a sacred moment of Truth from God through me to them. The messages from Him have always brought Peace, Hope, and Love in a way only His words can… and I am just the occasional messenger… an honor I do not deserve and will always feel grateful for. Being used by God is the biggest blessing one could ever ask for… and we are all called to His Purpose!He has shown me that he does not chose to bless us with miracles because of any “specialness” that sets us apart or above any other. There was nothing and is nothing better about me than anybody else… I believe that is one reason I was chosen. Miracles happen when we are open and according to His Plan. It is now my life calling to do my best at listening to his Voice as He speaks to me and live according to His Plan for me…which will always be so much better than my own! ← I’m Not Gay, So Why Do I Care?